Tracking time can be a pain, but not with Bill4Time. Designers, developers, home health care professionals and freelancers of every type use Bill4Time. A complete solution, Bill4Time provides 24/7 mobile time tracking, online invoicing and payments, project, contact and document management, and it integrates easily with QuickBooks. 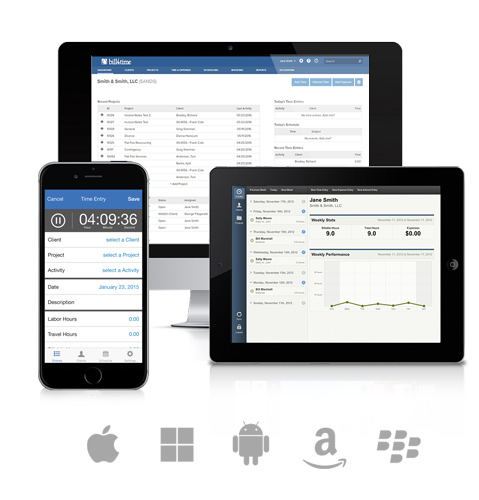 Bill4Time makes tracking time and managing your business easy. Freelancers often bill by the minute so ineffective time tracking can be costly. With Bill4Time, you can easily and accurately capture every minute and every expense–in the office or on the go. Bill4Time invoice templates are easy to brand and even easier to use. Save time with custom rates, flat fees. Bill by project or consultant. Integrates seamlessly with QuickBooks. Businesses that offer online payment options often get paid 30% faster than by traditional payment methods. Bill4Time online payments and secure client portal provides the online convenience your clients have come to expect. Better manage contacts. Easily track and manage projects. Store documents directly structured to client or project. Easily integrate with Box.com. Bill4Time offers a wide variety of reports including client summary, internal time, invoices, expenses and more. Easily customize your report filters. Anywhere, anytime on any deviceiPhone, iPad, Android, BlackBerry.